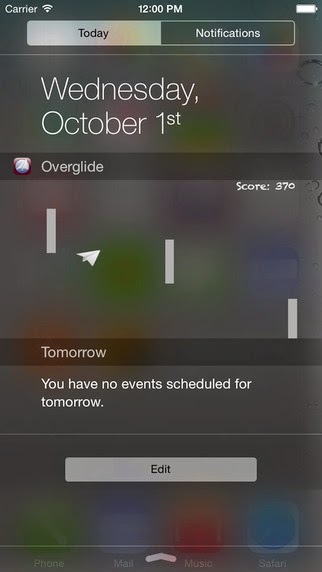 Now Apple finally introduced the widgets for iOS 8’s Notification Center, we are now able to see some great ways to quickly access important information on our iPhones or iPad. But few developers are pushing those widgets beyond just notifications. 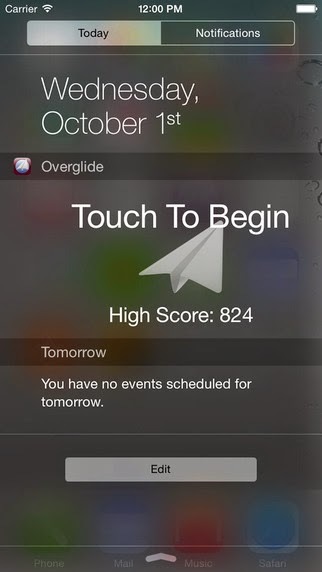 A new iOS game called ‘Overglide‘ now can actually be played directly from your iPad or iPhone’s Notification screen without unlocking your device. The game is very simple to play just like Flappy Bird and the bird character is just changed with an aeroplane. It runs very smoothly on i-devices and you can play it while pretending to peek at inbox or check the calender. Hopefully, Overglide is just the first games widget to hit the iTunes App Store.